Remedies in Construction Law brings together various well-established strands of the law and considers practical remedies for breach of contract and tort in connection with construction projects. This book continues to be a vital reference to lawyers and construction professionals seeking specialist insight into how remedies function in the construction sector. Roger Ter Haar QC is a silk at Crown Office Chambers, London, where his wide-ranging practice includes construction and engineering dispute resolution. 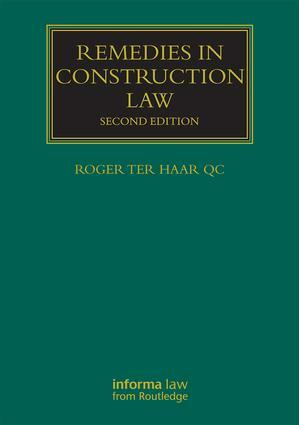 This series provides detailed and practical guidance to the legal framework of the construction industry. Whether explaining contract forms, advising on procedure, or guiding through disputes, highly experienced lawyers share their insights in order to help readers with the key aspects of any construction project. Engineers, architects, project managers, academics and lawyers in this field will all find these books a great help with issues that they face on a daily basis.